Is it a Pinafore? Is it an apron with a back? Is is a denim dress? Well whatever it is it’s getting worn to this afternoon’s BBQ! I’ve always loved a pinafore, even at school. No rolling up the skirt to look cool, for me. I’d rather it hang below the knee at a demure ‘Mallory Towers’ length. 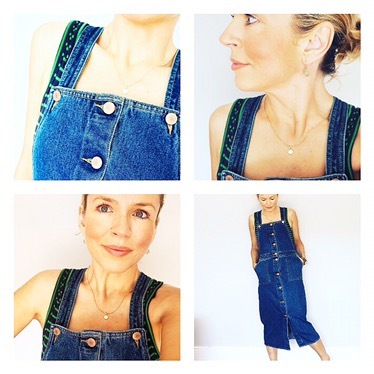 I love this because it combines that genre, with the classic & indispensable denim dress. Why classic? It’s denim which suits everyone. Why indispensable? They don’t crease and they have pockets. Plus a slighter stiffer fabric is flattering on even the lumpy / bumpiest days. This number is from the brilliant, cheap, edgy, wearable Swedish blighters, Monki who in their own words ‘do fashion like a boss’. I have to agree. Want nowweare40 updates sent to you directly?